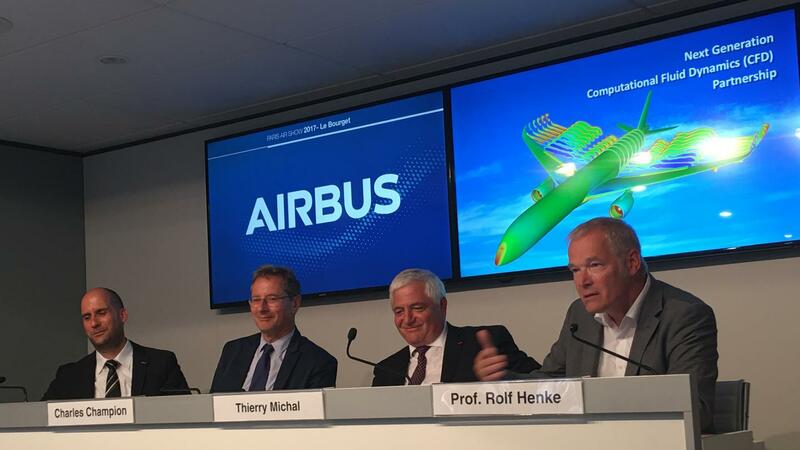 21 Jun 2017 Paris - On 21 June 2017 at the Paris Air Show, the German Aerospace Center (Deutsches Zentrum für Luft- und Raumfahrt - DLR), Airbus and the French aviation research institute ONERA signed an agreement on a strategic partnership to develop new software in the area of computational fluid dynamics (CFD). The cooperation agreement was signed by Rolf Henke, DLR Executive Board Member responsible for Aeronautics research, Charles Champion, Executive Vice-President Engineering of Airbus, and Thierry Michal, General Technical Director of ONERA. The cooperation will focus on the development of new common Computational Fluid Dynamics capabilities for flow prediction and will offer a common platform for the European Research Community. Airbus, ONERA and DLR also commit to deploy a strong common development and integration team with the capability to deliver tested and industry-ready code containing the latest state of the art features relevant to aeronautics. This advanced technology will play a key role in the development of new generation aircraft. "At DLR, we aim to advance the new trend of digitalisation in aviation, and hence address the challenges that the European aircraft industry will face in the next decades. We welcome this opportunity of teaming up with Airbus and ONERA to develop a common next-generation code. DLR's vast experience in designing Computational Fluid Dynamics software for air- and spacecraft applications will be an essential ingredient", emphasised Rolf Henke, DLR Executive Board Member responsible for Aeronautics research. "We are extremely proud to enter into this partnership with ONERA and DLR. Bringing the world-class Computational Fluid Dynamics (CFD) know-how of both research entities into a common next-generation code will not only give us a technological edge on the industrial side, but it will also provide a great platform for the research community to push the boundaries of computational aerodynamics", stated Charles Champion, Airbus Executive Vice-President Engineering. "This partnership is the opportunity to strengthen the ONERA-DLR cooperation with Airbus. Relying on centres of expertise in CFD in France and Germany for an ambitious project - to develop a state-of-the-art simulation software able to cope with challenges in the 2020s while remaining open for external cooperation", stated Thierry Michal, General Technical Director of ONERA.